So, yeah, the d20 is a magic die. If you recognize it, you already know it, and you probably own a bunch. This badge is a celebration of games like Dungeons & Dragons; a game that make my brain sparkle. It’s a Patron badge, meaning that it can be purchased and traded with other Monster Rangers. 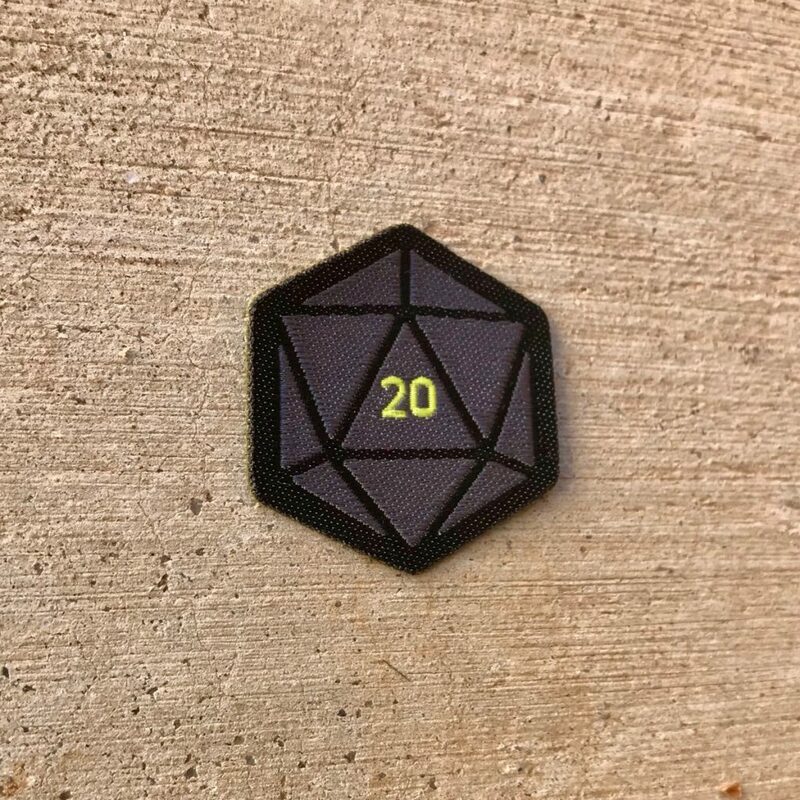 There is but 1 level of the d20 Spirit Badge. The “d” in “d20” means “die”, as in “dice”. “1d20” means to roll a d20 once. “5d20” means to roll it five times. But again, you probably already knew that. The d20 Spirit Badge is worth 20 Glory points, a more than most Spirit Badges. 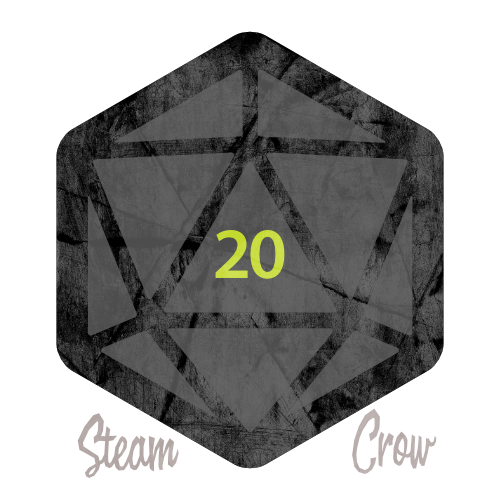 The d20, like it or not (I like it!) symbolizes RPG games, even if they don’t really use d20s. Fumble: Roll 3 times on this chart, and do ALL of the things. If you roll a 1 again, you can skip it. Eat a hot dog from the Mall or street vendor, while wearing a wizard’s hat. Document with a photograph with your d20 & hat. Balance a watermelon on your head. Document with a photograph with your d20. Make armor out of slippers; use a balloon as a sword. Document with a photograph with your d20 in the closet. Have someone take a photo of you jumping in the air, while doing “warrior moves” with your d20. Do 6 pushups, but also eat some pudding on the “down stroke”. Document with a photograph with your d20 somehow. Attempt to juggle seven d20s items at once. You will fail. Document with an “action” photograph. Tickle a tree. Document with a photograph with your d20 in the photo somewhere. Be smooth. Wearing a warriors helmet (horns a big plus) take 9 serious public photos. Share them on social media with #monsterrangers tag. Dress up like a MONSTER and take a serious photo eating an ice cream sundae. Share photo on social media with #monsterrangers tag. Eat a bowl of spaghetti with rich meat sauce and Mizithra cheese. Document with a photograph with your d20 buddy. Find the cheapest/weirdest possible sweet cereal at some market store. Eat it. Photograph it with your d20. Make a face that describes the flavor. Get some Monster Rangers who’ve never gamed before, and run a game for them. (RPG or board game.) But something that uses d20(s). Document with photos. Eat 15 saltine crackers as punishment. (Unless you like Saltines; then enjoy them.) Roll the d20 again. If you roll a 20, you can have some soup. Photograph with your d20. Go take a walk for at least 16 minutes… out of your house. Photograph your d20 in 3 unusual places on your route. Get a miniature (either one for RPGS or one like we send out with our orders) and paint it the best that you can. Photograph with your d20. Share with us on Social Media or the forum. Find the Ween song Learnin to Love, and listen to the whole thing. Memorize the lyrics. Keep your d20 in your pocket for majik. Balance a balloon on another balloon while standing on one leg. Get a d20 in the photo somehow. You can do it. Parent: attempt the above, while guiding your child. (Do it with them!) If it doesn’t seem possible/appropriate, substitute something that is. Just try to use a d20. *NOTE: Don’t do anything stupid or dangerous. For instance, if you can’t eat a hot dog for health reasons, eat something else. As usual, stay out of danger. (RANGER DANGER!) Swap out whatever you don’t want to do, with something else.